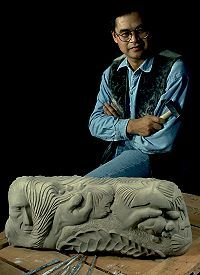 Born in Tuktoyaktuk, NT, in Canada’s Western Arctic, Inuit sculptor and multimedia artist, Angus Cockney spent 13 years in a Catholic-run residential school in Inuvik, NT. Later, Angus ventured South to study audio-visual communications. Returning to the North after completing his studies, he began creating art based on his culture, his concern for the environment and his desire to be an educator and spokesperson supporting the Inuit art world and northern peoples. Angus is now based in Canmore, Alberta and maintains a studio at his Rocky Mountain home and continues to create his art. He also actively pursues commissions and speaking tours throughout Canada and abroad. A former champion cross-country skier, Angus was chosen to accompany the 1989 Robert Swan "Icewalk" expedition to the North Pole as the Canadian member of an international team. Designated the team photographer, he captured many subtleties of the Northern environment in his imagery. The ice, snow and light patterns of the high Arctic continue to be reflected in his multi-media works and his stone sculpture. Drawing on a rich and varied life experience, Angus Cockney works with stone and other media - traditional in form but with a flexibility of thinking that embraces contemporary topics. "I'm a Canadian artist", Angus says. "I like to explore new media because through knowledge, comes power." Copyright © 2012 Angus Kaanerk Cockney. All Rights Reserved. Web Template created with Artisteer customized by SitesAtWork.com.